This ocean cake was requested by a bride and groom who loves fishing, all they really wanted was two ulua fishes kissing on the cake and this is what I came up with. This four layer cake had four different flavors, the first layer was a vanilla cake with a lilikoi (passion fruit) filling, the second layer was a chocolate cake with a mocha buttercream filling, the third layer was a strawberry cake with a guava filling and the top layer was a yellow cake with a pineapple apricot filling. This cake had to travel about 70 miles so I had to really secure this cake well, I used wooden dowels in each layer to hold up the weight of each layer and I stacked three of the layers at home. I used a dowel through the three layers to make sure it would not move while being transported. I stacked the last layer at the party venue and attached the kissing fishes. I started with a layer of buttercream under the fondant to keep the cake moist and the fondant in place. I used a cornflower blue gel paste color and just decreased the amount on each layer. I used molds to make the shells and sprayed them with cooking spay to give them a really nice shine, and they release from the mold easily. 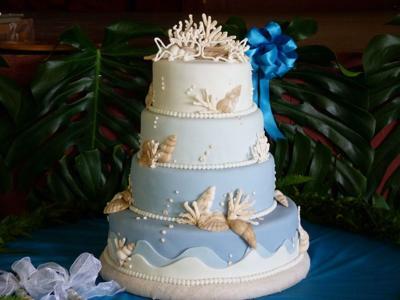 The bride and groom loved the cake and were happy that I was able to give them two kissing ulua's on the top of their cake. This cake really looks nice thumb up. You have done a wonderful job so artistic and I can appreciate all the work . The clouds are wonderful . I!m sure it was delicious also. Congratulations! You have created a work of art the bride and groom will always remember. This is wonderful and depicts the ocean very well. The shells and so on, I can see a fish as well. THUMBS UP. This cake is really beautiful, with good color, creativity out .